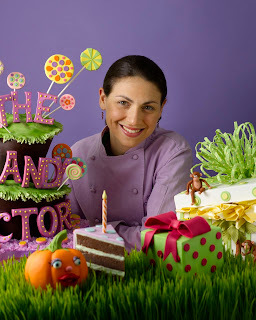 Today is a big day for New York cake designer Elisa Strauss, owner of Confetti Cakes. Her second cookbook titled Confetti Cakes for Kids is being released in stores and she couldn’t be happier. Being a published author of two cookbooks is only one of Elisa’s many accomplishments, which include first and foremost owning and operating one of the most well-known cakeries, Confetti Cakes. Elisa's beautiful distinct style of cake design has made her a media darling, capturing the attention of dozens of national and regional magazines, television shows, including Paula Deen and most recently on the Rachel Ray Show and The Today Show. She has competed three times on the Food Network Challenge series. In her precious spare time, Elisa shares her talent with other budding cake designers by offering cake decorating classes and making YouTube videos. Oh yes, and she recently made a 300 pound LEGO Batman cake for Warner Brothers. As a business woman and as a cake designer, Elisa Strauss is someone to admire, and as an interviewee, an absolute pleasure to work with. Rick and I have been aware of Confetti Cakes for a number of years now, and I had plans to interview Elisa since our blog interview series began. We initially "met" Elisa when she sent us an email introducing herself to cakelava, one designer to another, reaching out in respect, and we were taken by her kindness. As I discovered during our interview, Elisa is very sweet and wants to share her talents with others. She truly enjoys the process and gift of creating for others, and deserves all the successes both present and future that she has coming to her! Sasha Reichart: Let’s start with the basics, Elisa. Where are you originally from and how did you get started designing cakes? Elisa Strauss: Hi! I grew up on Long Island, just outside of New York City. I always loved to bake with my Grandmother and loved to draw. I studied art at Vassar College and then went off to Pastry School…so cake design was the perfect combination of those two art forms! Sasha Reichart: I'll say! Tell us about your name Confetti Cakes. What inspired the name? Elisa Strauss: After college, I started working as a textile designer and while I was in Pastry school I handmade all of my business cards out of rice paper that had flecks of confetti in them. That started to inspire me, plus when looking for a domain name it was one that was available! SR: I read you studied Fine Arts in school and have a background in the textile industry. 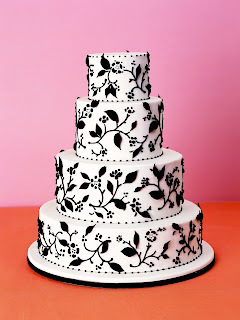 Can you share with us how you went from textile design at Polo Ralph Lauren to making your first cake? ES: While I was at Ralph Lauren, I was always making cakes on the side, before going to pastry school. I would teach myself through reading cake decorating books and taking a decorating class here and there. I would walk around with photos of my cakes like they were my children…and my brother made me the early stages of a website. While I was there, the VP of Womens’ Design asked me to make a cake shaped like one of Ralph’s favorite cars for his 60th birthday. SR: Talk about being in the right place at the right time! Did you find it difficult to make the transition from working with fabrics to working with sugar? ES: Not at all…I feel like there are so many similarities between my two jobs. So much of cake and textile is design, color, measurements, organizing, etc. Of course running your own business is a totally different thing. And making something out of cake is much more difficult then just painting it! SR: I understand when you opened Confetti Cakes that you started the business working out of a small apartment kitchen in NYC and worked there for a few years. When did you know it was time to make the transition to a commercial Manhattan space and I have to ask, how long did it take you to find your present space? ES: Yep, my tiny apt (600 sq. ft) turned into a custom cake studio and my friends and family didn’t know what they can touch or where they could sit when they came over. I was very organized but it still was hard to separate work and home life. I moved out when my business was featured in a magazine and I was saying in the article that I really needed more space and a woman who read the article contacted me to share a commercial space. We looked all over Manhattan and in the end I found a space down the block (two doors down) from my old apt. SR: What a great story! You make your cakes completely from scratch, which we do as well, and it makes all the difference but is also more time consuming. Is it because of your classic culinary training in Pastry and Baking Arts that you are so passionate about the way the cake tastes in addition to how it looks? ES: I loved going to Pastry school and it taught me so much about the industry and gave me the confidence to read any recipe, but I think my love for good tasting things comes from my desire to make people happy. I also couldn’t imagine making a beautiful looking cake that doesn’t taste good too. I am so proud of how our cakes taste…as my husband would say, “can’t we go someplace without carrying something” I always have to bring cake/cookies or brownies with me! SR: I'm sure your guests must LOVE you! Confetti Cakes is a custom cakery, offering no other pastries like cupcakes or miniature cakes, but this wasn’t always the case. What made you change your focus to exclusively custom cakes? ES: I actually LOVE to make decorated cookies, cupcakes and mini cakes but as a business it didn’t make sense. We would be in the middle of making a huge 5-tier cake and to stop to decorate 100 cupcakes …I just couldn’t charge enough to make it cover our overhead. Even though they were mini cakes, we would still spend a ton of time decorating them. SR: We know what you mean. The decorated cupcakes and miniature cakes are extremely time consuming. Does Confetti Cakes have a signature cake, or one you’ve become known for? I’m also known for making cakes look like real objects so anything people want replicated exactly we do. 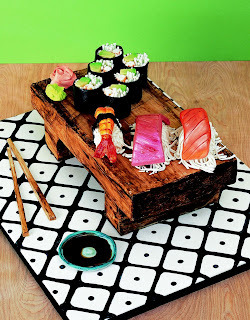 Our sushi, stiletto shoe and wine bottle cake are some popular ones. 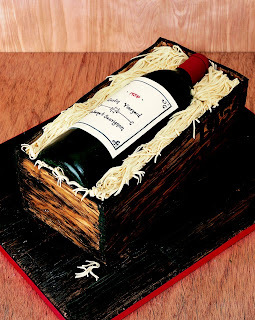 SR: What has been the strangest cake request you’ve ever received? ES: People always ask me that…but I don’t really have a good answer. Nothing is too strange….I love making anything that looks real out of cake. Some people find body parts weird but I don’t! If I had to pick one, then the cake we did to celebrate Fear Factor’s 100th episode was pretty gross/weird…it had a Rat part of a cake and roaches, and sheep eye balls…all of out of sugar but they sent us photographs of the real things to replicate. SR: Sounds gross, but completely marvellous. Wish I could see a photo of that! Do you work exclusively in fondant, or other icings as well? ES: Pretty much just fondant on top but we cover all our cakes with Swiss Meringue Buttercream before we cover them. We decorate mostly in gum paste and occasionally marzipan. 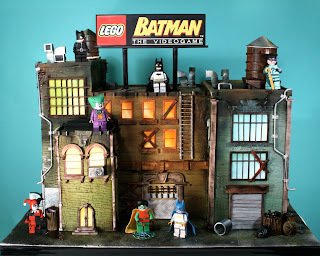 SR: I read on your blog about the 300 pound LEGO Batman cake you made recently. 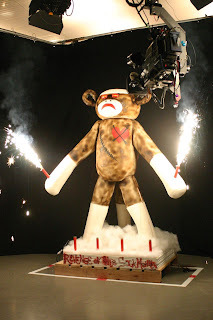 How tall was it, and how do you deliver a cake like that? ES: With six guys!!! It was so scary and stressful! I actually have to send you the video of us making it…..remind me to send you the link! It was only about 24” tall but very wide and all cake, that’s why it weighed so much plus the two wooden boards so that the cake wouldn’t buckle during delivery! SR: That is so cool! I’ve noticed a number of sculpted dog cakes on your website. They are very cute! Are you a dog owner/lover? ES: When I was a little girl I thought I would be a vet. I lived on a farm for a summer and have always loved animals but I don’t own any. My dad is the real dog lover, I made a replica of his favorite “child” for his 60th birthday. That’s what started the Youtube videos. Please join us tomorrow as we continue on our journey with Confetti Cakes. 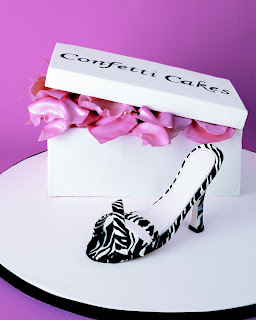 Take some time to get to know Confetti Cakes by visiting their website and blog!